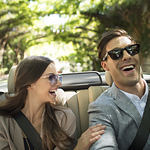 With the days growing warmer and brighter, the open road entices motorists to get behind the wheel and enjoy the scenery unfolding all around them. Any great journey requires preparation, however, and a road trip is no time to skimp on safety. Have a friend stand outside your vehicle and check that all brake lights and turn signals are responding as they should. If your battery seems at all sluggish when starting your car each day, now is a good time to replace it. If your brakes haven't been changed in a while, add those to the list of things that need replacing before you leave. Check that your spare tire is in working condition and refresh your knowledge of changing a tire. You'll probably want to have your oil changed as well, especially if you're planning a trip of a thousand miles or more. It's always good to have your vehicle inspected before embarking on a long road journey. If your travel plans include a road trip, be sure to visit us at Westend Hyundai, where our mechanics will be on the lookout for any maintenance issues that might spring up during your trip. They'll also be available to answer any questions you may have about keeping your vehicle performing its best while on a road trip.